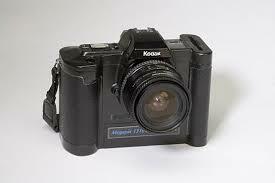 Kodak was synonymous with cameras. With all things photographic. You bought a Kodak camera. You loaded it with Kodak film. You used Kodak flashbulbs. You got your pictures processed using Kodak laboratories using Kodak chemicals. You got your photos back from the chemist, or through the post, and they were in Kodak folders printed on Kodak paper – or if they were slides you used a Kodak projector to screen them onto your living room wall. The term “a Kodak moment” became vernacular for describing a moment so glorious it should be captured on film. So in other words, Kodak WAS photography. But hold on – Kodak invented the digital camera. So why isn’t Kodak the market leader? It’s not the market leader. In fact it’s not even in the photographic business anymore. It went bankrupt. What happened to Kodak is fascinating – and we can draw personal lessons from analysing the death of a corporate giant. 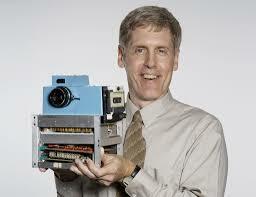 In 1975, a 24 year old engineer named Steven Sasson, working for Kodak, invented the first digital camera. Compared to what we use now, it was huge. It took 23 seconds to produce a black and white image that was 100 pixels by 100 pixels. The thing was, Kodak had held a dominant position in the photographic market for more than 100 years. They were making money on every stage of the photographic process. They didn’t want to take on anything which could in any way threaten their stranglehold. Kodak was ahead of Nikon, and Canon. They were the first to market. So what happened? Why didn’t Kodak capitalise on their invention? They never made decisions fast. Why should they? They were based in Rochester, it was a company town, and they didn’t abide with outside criticism. They were Kodak, after all. The market leaders. Kodak saw change coming – they knew that digital was the future – however they were old world, cumbersome, and they misjudged their place in the world. They became victims of their own corporate hubris. Interesting, at the same time a Japanese company, Fujifilm, was also facing the same dilemmas. The Harvard Business School, and business colleges around the world, have since made case studies of why Kodak went bust and Fuji thrived. Fuji now holds a significant market share of the digital camera market. What’s interesting is that many thought being a highly structured hierarchical Japanese company, they would not handle change, and that a US company would – the United States leading the way in technology advancements via Steve Jobs and Bill Gates. But no, Kodak wasn’t nimble enough – and the Japanese were. What personal lessons can we learn from this? We have to be nimble. We have to be aware of complacency. We have to be aware that the world is always in flux. We have to accept that ego and pride are ultimately not strengths, but weaknesses. You can have a lot of money. You can have a big house. An expensive car. You can have personal and professional status. All of this is transitory. It can be taken away from you. Kodak thought they were the big cheese. Now they’re gone. Personally, I have learned a lot from the death of a giant. You will have to tell me in India Britta – I’m intrigued! You’ve led, and are leading, a remarkable life Steve. You didn’t screw anything up though. You lived life, you learned lessons. As we all,do each day. You’ve just flown much higher than most of us! And of course the higher you fly, the more spectacular the crash! You are a man of extremes – extraordinary wealth, then one day it’s gone. Extraordinay health and fitness, then one day it’s all gone. There’s past life karma happening here, I suspect. It has to be cleared. You can’t keep doing this. Apart from anything else it’s too tough on those that love you – and there are many, myself included! Hey Angela – did I reply to this? If not, then yes – I agree. Life is to learn lessons – often carried over from previous lifetimes. Unless of course you walk the Camino, and then all your wrongdoings are absolved, no? In which case I need to walk many more Caminos!